This week’s image comes from a fantastic new Flickr photostream by Richard Yaussi. In recent days I have been in touch with more Studio workers, social-media groups for former Home Savings employees, and individuals from all walks of life with more information to add to this research (and corrections for the list, which will soon get a makeover). 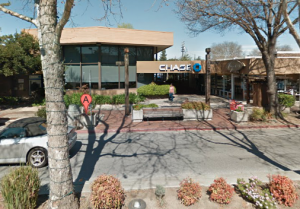 I was even interviewed by a blog post about the San Jose Willow Glen Home Savings branch, and got an interview with a former branch employee in return, who helped save the interior murals when Washington Mutual wanted to paint them over. I am thankful to continue to find such enthusiastic fans of this art and architecture, and my research on its place of Home Savings within the urban context of its communities! These differences run through many of the early Sheets projects — some, like the 1954 centennial lithographs for American Trust Company (which was accompanied by an Ansel Adams book as well), seem to share the motifs and style of the later Home Savings bank work to a great extent, while others, like the Bullock’s Men Store mural reproduced in one of Sheets’s early art-show catalogs, seems radically different. And of course information about these sites is much appreciated! Your faithful historian/researcher/blogger will away for Passover, so the blog will not get a new post until around April 20. Millard Sheets, sketch of Monument to Democracy for San Pedro, 1954. Courtesy of Alan Wofsy Fine Arts; my crooked image. The L.A. Conservancy tour, like many of my efforts, focused on preserving the art and architecture of the Millard Sheets Studio, and to understanding what it has meant for its communities. But, like all artists and architects, there are the projects that didn’t get built. And unbuilt projects can often be fascinating in their counterfactual, floor-moving-under-you way, a vision of a city unvisited yet so familiar. 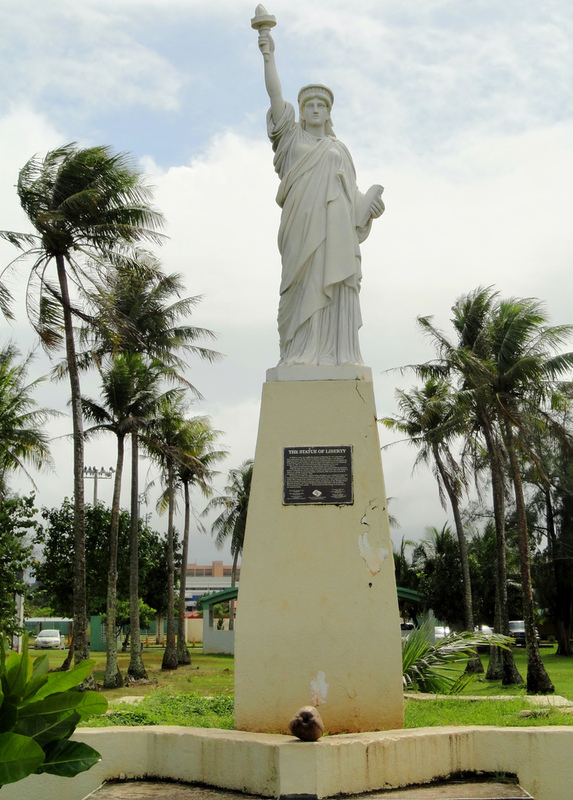 This statue seems the biggest unbuilt project in the Sheets oeuvre: the Monument to Democracy, a 1954 effort spearheaded by LA County Supervisor John Anson Ford to build the Pacific Ocean’s “Statue of Liberty” companion in San Pedro. The course of Democracy is moving westward. The great nations about the Pacific basin are looking across to America trying to discern whether our Democracy is really something for all, or is in effect a concept reserved for the Anglo-Saxon. Communism tries with cunning and skill to alienate all of darker skin from the ideals that motivate our Western society….When this project becomes a reality, as it certainly must, countless millions will find their way to it, there to be inspired by its majestic symbolism, and there to learn something of the unending story of how Democracy has inspired and blessed mankind. 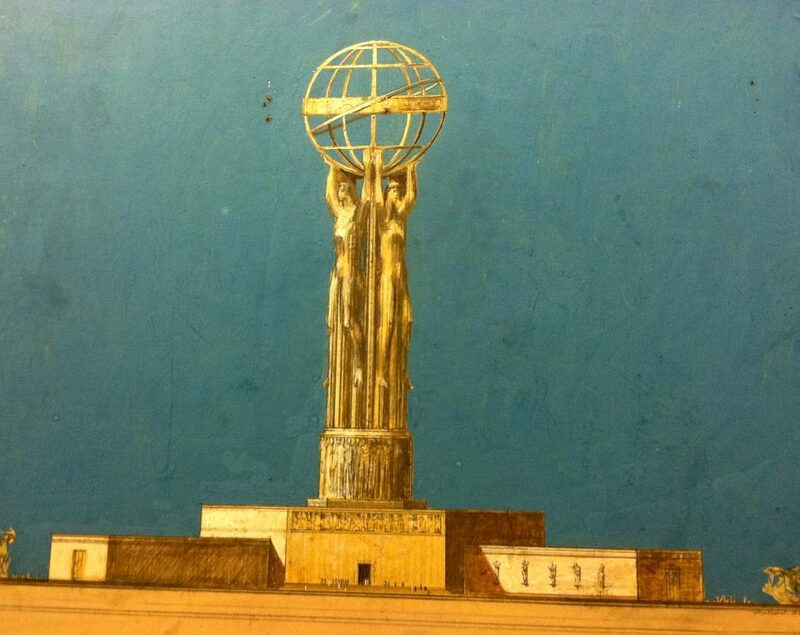 Intended to be 480 feet tall, on a drum base 46 feet hight, topped with a bronze globe 125 feet in diameter, the Monument to Democracy was to have three figures, each 250 feet tall, on top of historical and art museums revealing the progress of each of the world’s races toward democracy. (I guess we are talking Asian, African, and European here — not a period of much considered of indigenous American peoples.) Millard Sheets was listed as the project’s designer, with the statue to be designed by his colleague, sculptor Albert Stewart. This funding prospectus was circulating just as Sheets was completing his first project for Howard Ahmanson, the remodel of the National American Fire Insurance building, then at 3731 Wilshire (now the site of the Ahmanson Center). If Sheets and Stewart were to have become wrapped up with this statue/museum project, how different southern California would look! One iconic statue, for good or ill, would have replaced the effort, history, and messaging that Home Savings received, to different ends. Sue Hertel and John Wallis stained glass, carousel (detail), Montebello, 1974. This site has been recently leased by a future good steward. Last week I stopped into the Sunset and Vine branch of Home Savings. The mosaics look good, and the painted mural is mostly visible behind some cubicles. (As Tony Sheets mentioned this weekend, bank tasks change, and hence these spaces have had to evolve.) But it was the condition of the stained glass that stayed with me. The Hollywood branch stained glass had some cracks, holes, or other damage–covered up with blue electrical tape! 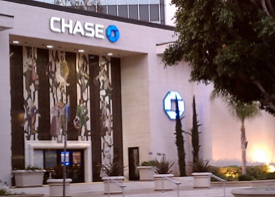 I introduced myself and told both the bank manager and Chase’s regional facilities manager who to contact for repairs: John Wallis and Associates stained glass. In the current Huntington Frontiers magazine, I write about the marvels of the mosaic studio archives, from the time under both Millard Sheets and Denis O’Connor. But a visit with Susan Wallis, the current head of the stained glass firm and John’s daughter, and Helen Wallis, his widow, opened another window (pun intended) important for my research. The Wallises generously explained the workings of the stained glass studio, and provided a chance to see their extensive files about the research, cost, process, and repairs of the stained glass. 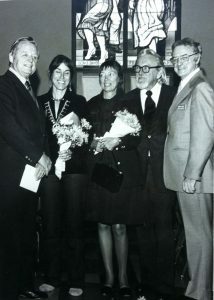 Millard Sheets, Sue Hertel, Helen and John Wallis and (bank official?) at an opening. Courtesy of John Wallis and Associates. Building designs, mosaics, and painted murals were all done in-house at the Studio, and the archives are filled with Millard’s correspondence about furnishings, carpet, tile, and paint color, and other details. 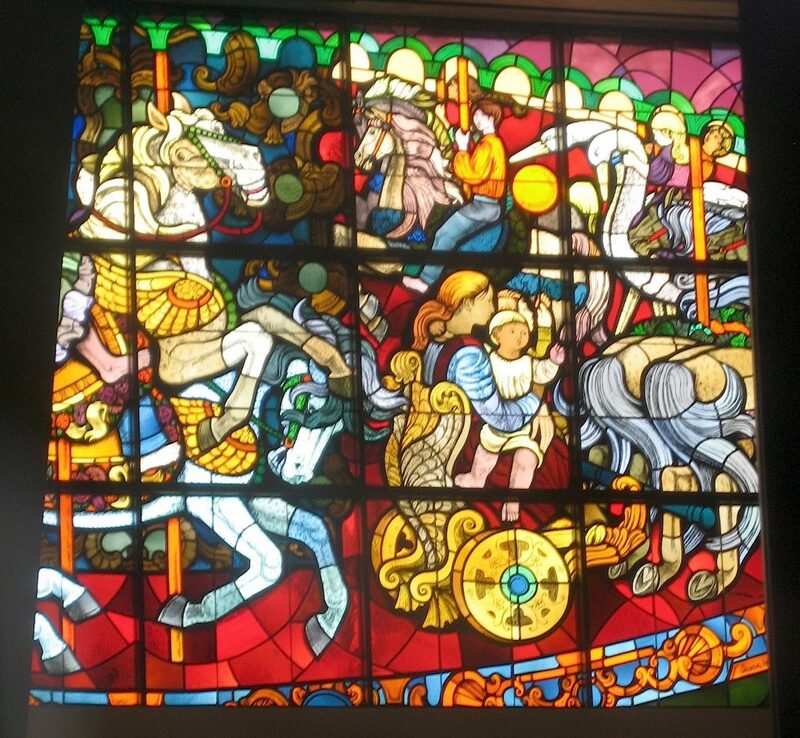 But like sculpture, stained glass was a skill outside of Millard’s direct purview. 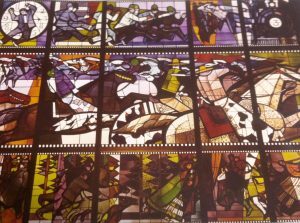 In the case of glass, it was Sue Hertel, armed with the designs approved by Millard, who came over to the Wallis-Wiley or then John Wallis studios to select the glass colors, approve the “waxed-up” temporary design, and to paint the final details onto the windows. The discussion of repairs in the files is really fascinating, too. From the very first years, there was vandalism, settling, earthquakes, and accidents that led to cracks and holes, and (mostly in the case of the 1994 earthquake) whole panels falling out and needing to be replaced. 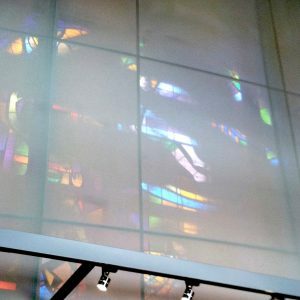 Using the original instructions, the same materials, and the same methods, Susan Wallis has kept the windows in pristine condition, with no indication of what had been replaced. And – just another word of thanks to all those who came out to the L.A. Conservancy’s Mod Com tour and panel of Millard Sheets’ art and architecture last Sunday. The crowds and enthusiasm were great, and I enjoyed meeting so many of my correspondents, and seeing old friends in the cause. If you have a memory, story, or question about the work of the Millard Sheets Studio or Home Savings, please do get in touch with me! Millard Sheets Tour This Sunday! Getting a head start on the tour! Visitors at the Millard Sheets Studio, Claremont, c. 1958. Courtesy of the family of Melvin Wood. I am preparing my introductory slides and remarks for the L.A. Conservancy’s “Millard Sheets: A Legacy of Art and Architecture” tour this Sunday, March 18, so I won’t say too much here — except to encourage you to come! 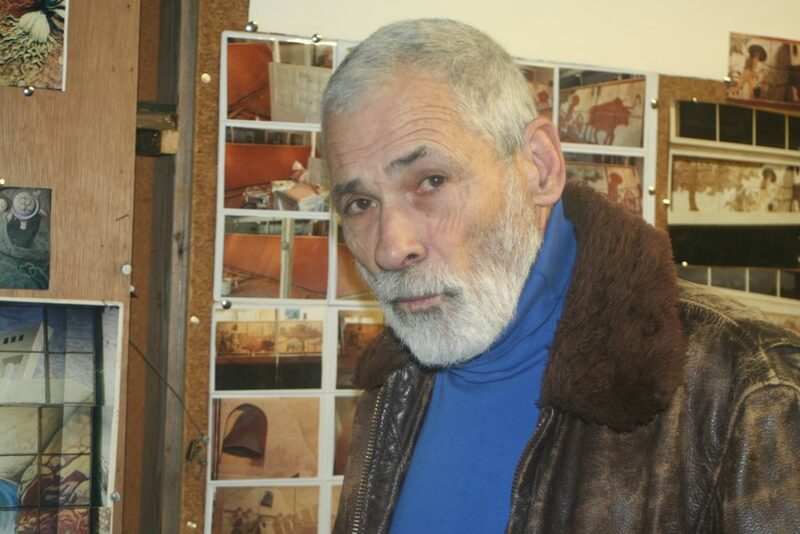 The Conservancy has docents ready to explain seven sites in Claremont and Pomona with art and architecture from Millard Sheets, including his studio where much of the work was completed. And then there is the 5:00pm panel, with sculptors Betty Davenport Ford and John Svenson, Sheets Studio architect Rufus Turner, Sheets Studio mosaicist Brian Worley, and two of Millard Sheets’s children, Carolyn Sheets Owen-Towle and Tony Sheets. And I am told many other individuals who worked in the Studio and on related art and architecture will attend as well. This is a one-time-only set of events, so what are you waiting for? Buy those tickets now! See you Sunday! Susan Hertel and Alba Cisneros, wall hanging for Torrance branch, Home Savings, 1980. Image courtesy of Alba Cisneros. The vast majority of Home Savings’s distinctive art and architecture cannot be moved easily: mosaics; stained glass; giant painted murals; large sculptures; and the architecture of the buildings themselves. 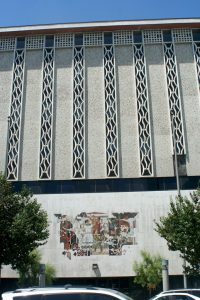 In a few cases, they have been torn down or painted over, but for the most part the artwork is in place, though at times hidden or damaged by changes to the bank’s layout, security, or convenience features. But this week I want to focus on that which was movable from the Home Savings banks, and see if you my avid Internet audience might have ideas on where items are. There are some wood-panel murals that have been removed from the Pasadena Home Savings and the Pomona Buffum’s, as well as the mural from the Beverly Wilshire Hotel; these all seem to be safely maintained. There are the original Millard Sheets sketches for Home Savings projects, some of which are for sale by Alan Wofsy Fine Arts. 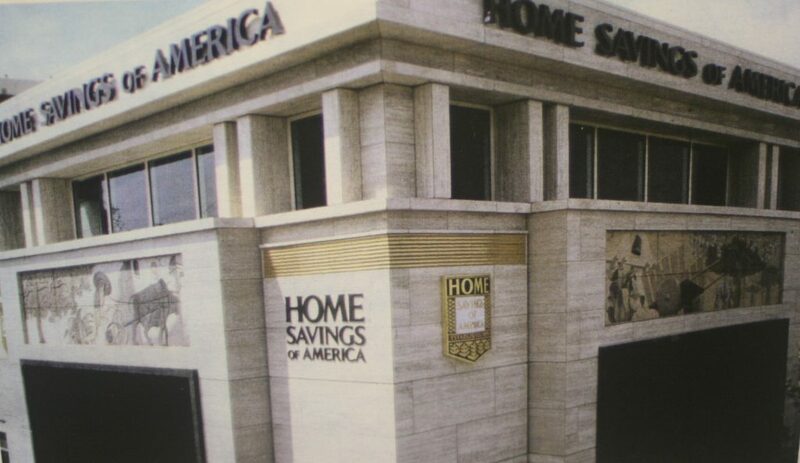 And there are various commemorative brochures and prints offered at the openings of Home Savings in Beverly Hills and Hollywood, and Pomona First Federal in Claremont and Pomona; I have seen a number of each, some in library collections. 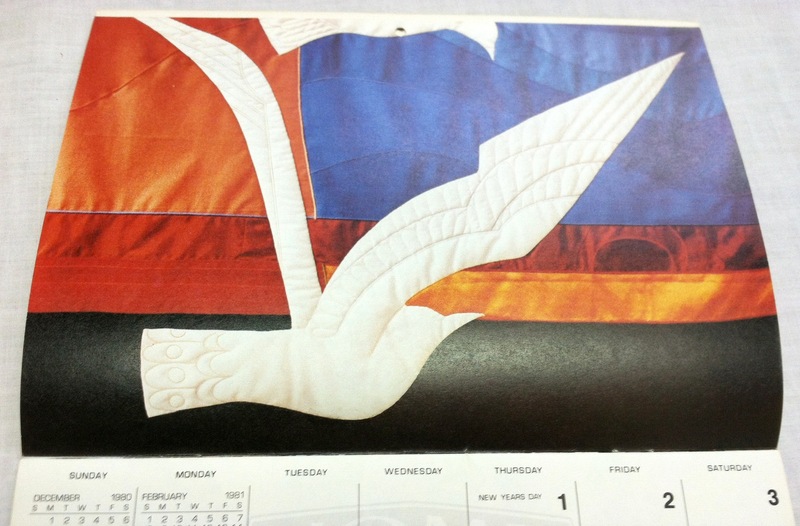 There are calendars and advertisements too, with fascinating messages, which are harder to find — more on that in another post. Susan Hertel and Alba Cisneros, wall hanging for Huntington Harbor branch, 1979, in 1980 Home Savings calendar. Image courtesy of John Wallis and Associates stained glass. 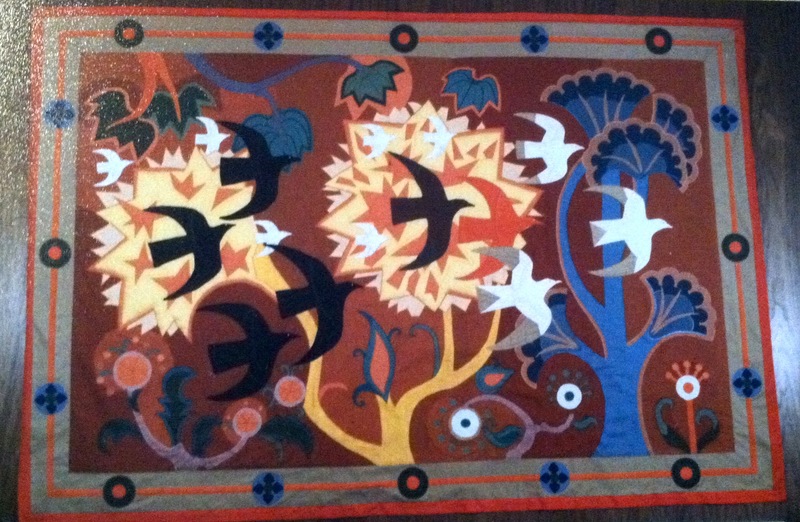 Alba Cisneros, who worked in the studio for many years, recalls having these wall hangings stretched out across her living room, sewing them quickly for the bank opening. Their theme and color palette, by Sue Hertel, reflect traditional Home Savings designs, but the new medium provides new textures and depth of color — as well as the portability that leads to the question of where they are. Do you have leads on any of these items? Are any still in these banks? Have they been preserved? Do let me know. Also: a REMINDER of the L.A. Conservancy’s Millard Sheets tour in Claremont and Pomona on Sunday, March 18, 10:00am-4:00pm. At 5:00pm there will be a panel discussion with Carolyn Sheets Owen-Towle (Millard’s daughter), sculptors Betty Davenport Ford and John Edward Svenson, architect Rufus Turner, and Studio mosaicist Brian Worley — and I will introduce the session with slides relating the tour sites to my overall research. I assume lots of others involved with this artwork will be there too. Hope to see you! I have been on the Southern California freeways a lot recently–driving down to San Diego, out to Claremont, around and around the LA Basin, discussing my first book and finding new leads for Home Savings research. And though I have written before about the efforts to catalog what makes the Home Savings and Loan buildings distinctive, I have found another pattern worth noting: the Home Savings and Loan office tower. 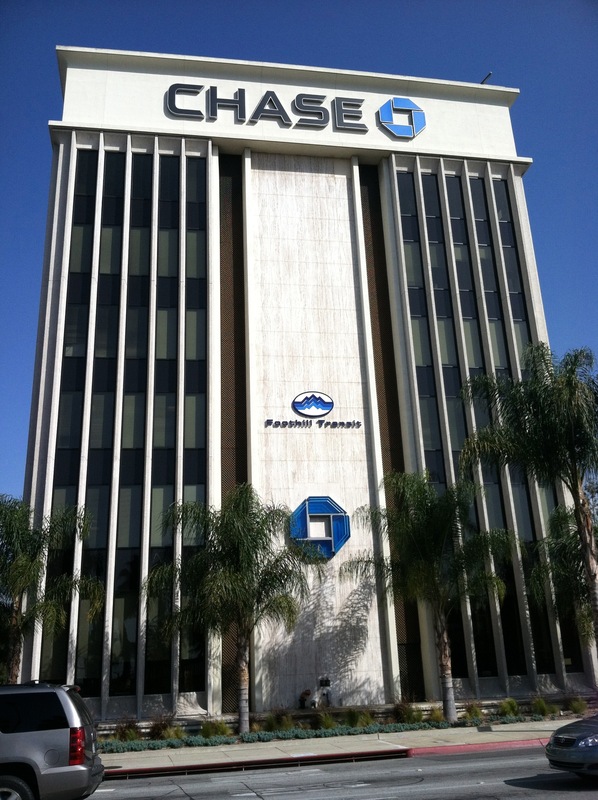 The first Home Savings tower seems a fluke: it was built in 1962 as part of the downtown Pomona Mall redevelopment, a project that was a love note from Millard Sheets to his hometown, and something Howard Ahmanson and Home Savings seem to have joined as a favor to Sheets. The mall was toasted nationally as the future of urban renewal, and then faced its own decline — and now Chase has threatened the future of the tower as well. (Come tour the Pomona sites, and learn more from docents, a panel of Studio participants, and knowledgeable folks like me, at the L.A. Conservancy tour March 18th). The tower was a one-off — Home Savings was not then in the business of building large office towers, nor of owning and managing commercial real-estate. And, because it may be the only Home Savings tower to have Sheets Studio art, I basically ignored the other towers for a while. But I have been recently thinking about how the Home Savings brand was maintained by architecture even as the Sheets Studio branches changed (a topic for a future post), and I began to think more about the Glendale tower, and the Covina tower, and the one along the 405 in… Carson? Signal Hill? 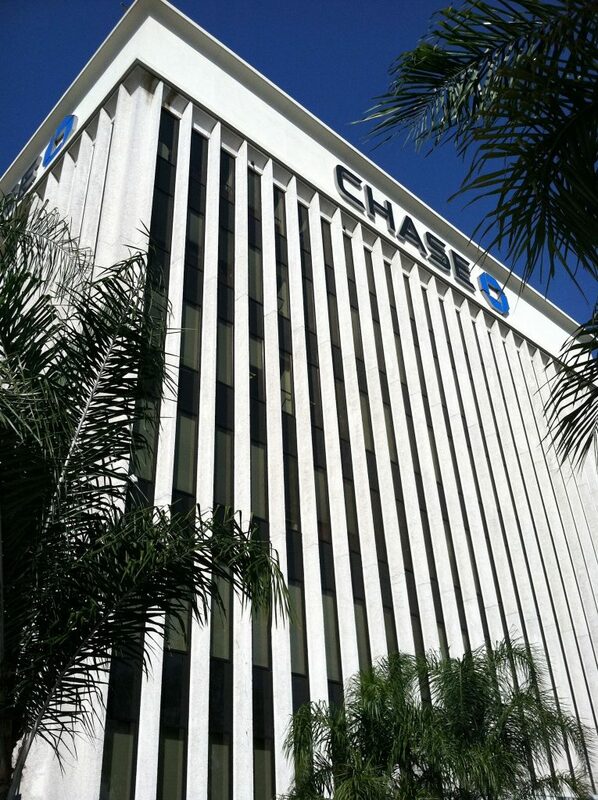 Clearly, Home Savings and Loan did become interested in tall office towers, likely for their commercial real estate space and their large branch spaces, after the S&L banking laws changed. Home Savings towers are in sight of the freeway, along the main streets of these suburbs, and hence often they are the only office tower of their kind in, say, Covina. 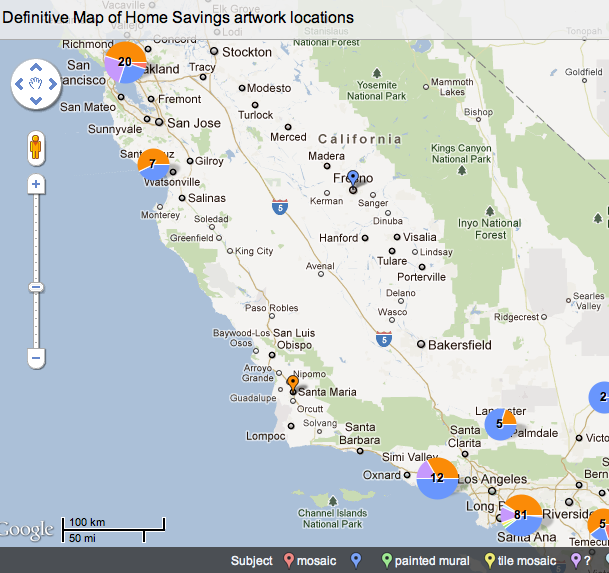 This reflects a continuation of the Home Savings siting policies of the decorated branches. But the choice not to include Sheets Studio art, combined with the ubiquity of this generic, pared-down modernist architecture, suggests these towers no longer stand out from their postwar peers. But they do serve as a part of the story of art, architecture, and the urban context of Home Savings and Loan — if a subtle one. I was sad to learn that Martha Menke Underwood died on February 15, 2012. I had the chance to visit her in November 2010, on a day she was at work in her painting studio; like so many of the Pomona Valley artists with whom Millard Sheets collaborated, she had achieved renown in a number of media, before, during, and long after her time working for the Sheets Studio. She was especially known for her tapestries and other “stitchery” works. Martha had studied with Jean and Arthur Ames; Arthur had overseen her master’s thesis, and shared an interest in the revival of tapestries as a fine-art form. After graduating from Scripps and Otis, Martha was briefly employed by Wallis-Wiley Stained Glass (the contractor the Sheets Studio used as well) before working directly for Sheets. 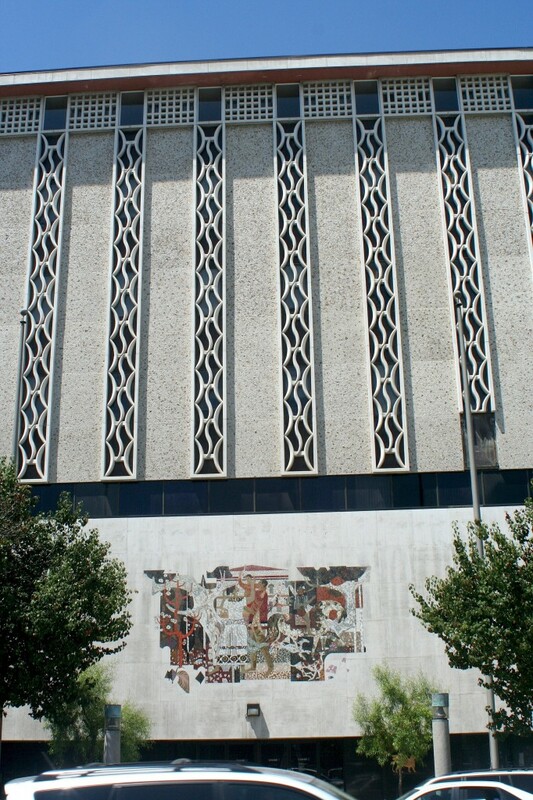 Some of her tapestries hung in the first major Sheets bank commission, for Mercantile National Bank in Dallas; she also became essential to the design, installation, and construction of the early Home Savings mosaics. Martha left the Sheets Studio soon after she was married, to the Sheets Studio architect S. David Underwood, in around 1960; they later divorced. But, in those busy years, Martha Menke Underwood was instrumental to the creation of the Sheets Studio style of mosaic work. 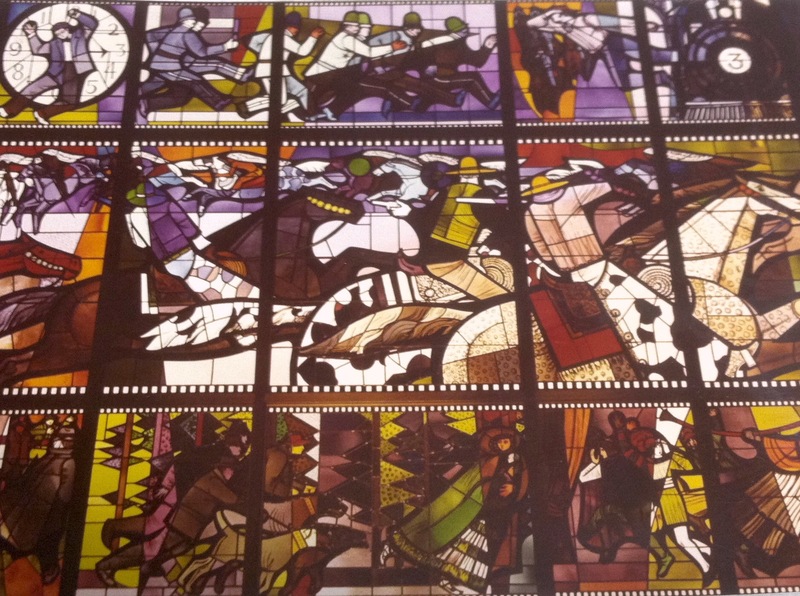 Though mosaics were essential to the new look of art and architecture that Millard Sheets was providing for Howard Ahmanson beginning in 1954, Sheets and those around him had no expertise in how to create them. Initally, the mosaics were designed in the Sheets Studio but sent to Italy or, Martha said, to Mexico for fabrication, but Sheets grew frustrated with a process out of his control, sending back versions of his designs stylized against his wishes. According to Martha’s account, she was tasked with figuring out the process. 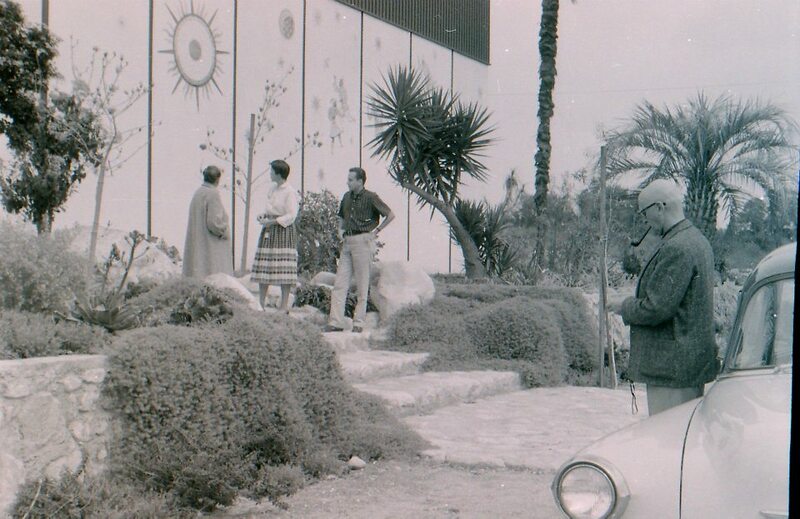 After more frustration with imported mosaics–she specifically remembered having to piece together the outline for the Arcadia Home Savings and Loan mosaics on the spot, as the concrete backing for the installation waited–she took charge of ordering smalti and creating a tile-cutting and -setting procedure in the Sheets Studio. Martha remembered how exhilarating but stressful work for the Sheets Studio could be. 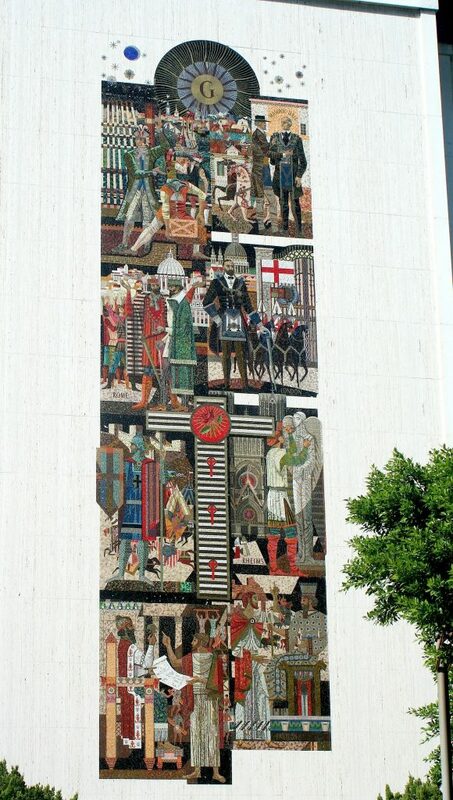 As the timing for completion of the Los Angeles Scottish Rite Masonic Temple mosaics was tight, various sections of the four-story-tall exterior mosaic were taken for installation before she could be sure the colors and lines could match up. But I think the resulting mosaic (below) demonstrates how it worked out! Finally, Martha decided to hire an artist who would take over the details of the mosaic operation, from ordering to installation. Her search led to the Studio’s master of mosaic fabrication, Denis O’Connor, whom Martha helped to train. 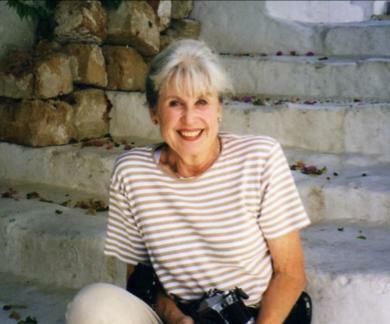 Martha continued working for the Studio, part-time, and contributed to the iconic mosaics at Sunset and Vine, the Garrison Theater, and Notre Dame, among other projects. Martha Menke Underwood followed the pattern of many Pomona Valley artists in finding the time working for Millard Sheets as invigorating but ultimately distracting from her own art interests. She credited Millard Sheets with arranging for her large-scale tapestries to be woven at the historic looms in Aubisson, France, and she stayed close to many of her fellow artists; she also taught art for 27 years at Chaffey College.. Her website holds many of her last works, as well as a picture with a wide smile, much like the one that welcomed me. She will be missed. It is great that the Millard Sheets Papers and the Denis O’Connor Papers have been donated to archives.They provide a tremendous amount of detail about the art and architecture of Home Savings, starting in 1954. There, the work of the Sheets Studio team is documented — a changing cast including these two men; their main collaborator Susan Lautmann Hertel; architects S. David Underwood, Rufus Turner, Robert Kurtz, Robert Nilson, Milton Holmes, F. Arthur Jessup, and Francis Lis, and Frank Homolka and Jess Gilkerson of Long Beach; contracted sculptors such as John Edward Svenson, Betty Davenport Ford, Albert Stewart, Renzo Fenci, and Paul Manship; John Wallis and Associates for stained glass fabrication; other Pomona Valley artists such as Arthur and Jean Ames, Martha Menke Underwood, Melvin Wood, and Sam Maloof; studio regulars including Nancy Colbath, Alba Cisneros, Brian Worley, and Jude Freeman. More than 200 projects are documented in this way (though the records remain incomplete, as described here). But then there are at least 14 other Home Savings buildings with art and architecture to consider. Starting in 1989, Home Savings (then expanding as Savings of America into Florida, New York, and other states) decided to cut ties with Denis O’Connor and Sue Hertel, for reasons I have not quite figured out yet. At first, Home Savings fine arts coordinator Kristen Paulson added artists such as Steve Rogers, Richard Haas, Roger Nelson, Marlo Bartels and Astrid Preston, and in the final few years of commissions, these artists replaced O’Connor, Hertel, and the Sheets Studio method. Why? Was it cost? Theses final works are mostly painted flat-tile artworks, still painstaking but less expensive than the traditional Sheets Studio mosaic. I am seeking out these artists to learn more, and I had the pleasure last month of interviewing Steve Rogers. 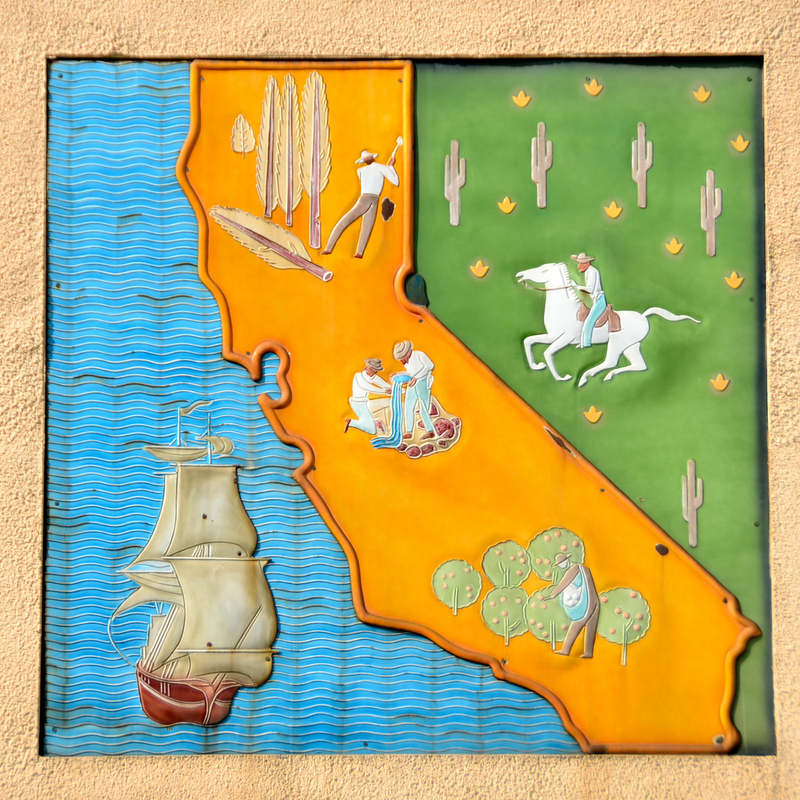 Steve first gained attention for his bas-relief panels of boxing scenes; in 1989, he received the Home Savings commission, and afterwards did a marvelous scene in the lobby of the Los Angeles Metropolitan Water District, the relief on the tiles jutting forward with the rush of the water. He has been recently working on fantastical images of chickens, showing the same energy and attention to bright colors and contrasts that his earlier work has shown. Speaking with Steve Rogers and seeing his notes and files from the Home Savings commission, I was struck by how similar the process remained from the earliest works: choosing a theme that reflected local history or community; input from the artist and the bank representatives on themes and edits to make; and then the logistics of fabrication, engineering, and construction to get the image ready for permanent display along a busy street, over the door in earthquake country. From the street (as we saw on the Autry bus tour of the Valley Home Savings sites), it looks easy, and simple: those images of Day Begins and Day Ends (titles the artworks should have but that are not on the pieces, another characteristic omission) at the local mission, the carreta out front, the man hard at work. But, from the files, you can see the negotiations, the short time frames, the worries and contract provisions that went into making this art. From Steve, I got the same sense of what I can find in these files: this work was exhilarating, but the uncertainty could also be unnerving — Would it be done in time? Will I make any profit? Will there be another commission? Steve’s work shows the same knack for crystallizing the sentiment of the community, but unfortunately, he has not been chosen for similar projects after the Metropolitan Water District. I am in touch with more of these artists, and I welcome contact from even more artists, and their bank liaisons. I look forward to sharing more of the stories from the oral histories on the blog and in the eventual book. The responses to the “definitive list” have been great! I know the spreadsheet section is a bit hard to read, but the interactivity of the map provides a nice perspective on the scope of the project. I will integrate corrections, updates, and even clean up the map data in the weeks ahead. I even had a chance to see a 1992 Home Savings directory, so I can get a lot of the missing addresses. But the addresses and the maps can’t do everything — and neither can the archives. As I may have mentioned, the Millard Sheets Papers and the Denis O’Connor Collection are spectacular resources for the workings of the studio, the names of those artists involved with each project, the costs and the timeline. But the paper record often peters out, and it can be unclear whether the project was suspended, canceled, finished by someone else, or simply completed without incident. Google StreetView can provide some knowledge about what is there on the outside now, and historic photographs, when available, provide great evidence of what was there. But often all we have is memories about what was there — and so I ask again for your help with those memories. 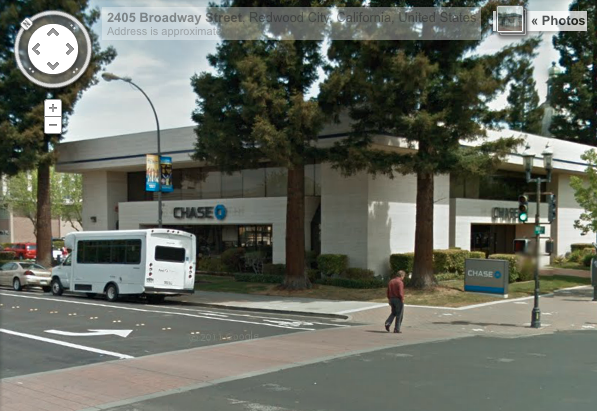 The Redwood City branch provides a case in point. I visited Redwood City in the spring, on a swing through the Peninsula branches (more for the website, one of these days). The building was a Home Savings, it was clearly designed by Frank Homolka, and Update: This seems to have been a Guaranty Savings and Loan, a northern California bank chain once controlled by Howard Ahmanson, until 1958. It seems to have had a Sheets painted mural over the teller windows. I asked a manager about it, and he said it had been painted over — seemingly another case, like the West Portal mural, of Sheets Studio artwork being lost. But — in the archives there is a discussion of a “Redwood City” branch at 650 Santa Cruz Avenue in Menlo Park, and an order for two pumas from sculptor Betty Davenport Ford. I visited that location, and didn’t see evidence of those pumas either — but it is possible they, too, were never installed. So, do Redwood City and Menlo Park have two cases of missing Sheets Studio art, or (as I suspect) was there never a mural there to paint over? 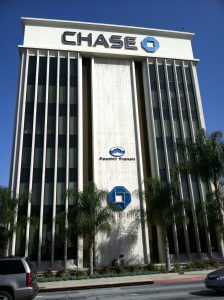 Only those of you who have lived near this branch and banked there before 1998 can let me know for sure. The archives and the current visits can only get us so far. See the current “definitive list” here — and the interactive, scalable map of the locations (with some somewhat misleading information on which artwork is where) here. Map courtesy of BatchGeo. Well, I have finally done it. About two years after I discovered I was working with hundreds, not dozens, of sites, I finally have something like a definitive list of the 138 Home Savings / Savings of America sites with artwork ready. This is thanks to the archival Sheets Papers and Denis O’Connor (DOC) Papers, and the notes in those files from Sue Hertel (SLH in my code) — and a lot of hard work from volunteer (and former Home Savings employee) Teresa Fernandez, and the magic of Google StreetView. It is not perfect — and I need your help to send in corrections. Send in correct addresses, send in new status updates, send in alerts of places you think are threatened. I have found that the California Art Preservation Act is included in many of these contracts between artists and Home Savings — even when the artwork was in, say, Florida — so there is a mechanism to help with their preservation. This is an imperfect simplification of my main work database, which holds the names of each artist who worked on each piece, archival notes, construction dates vs. completion dates, and more. But I do hope that it leads to a lot more information about the current state of this artwork coming to light!